Volkswagen South Africa are proud to announce that the Golf 1.6 TDI BlueMotion has come out top at the annual Women on Wheels Car of The Year awards. 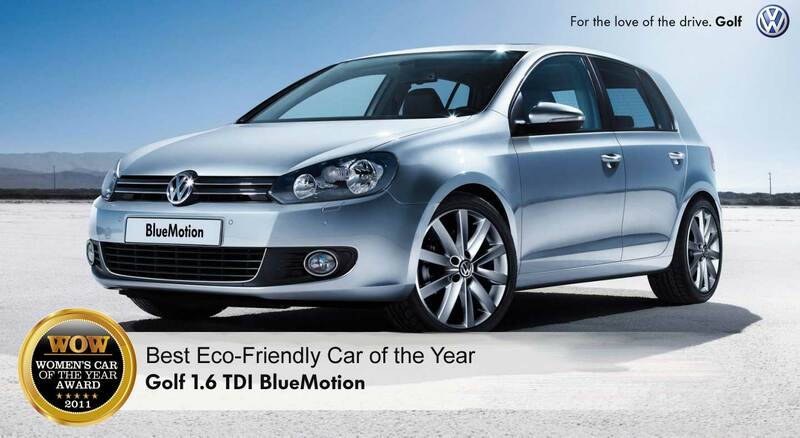 What sets the BlueMotion apart from other eco-friendly vehicles on the market today, lies in the sum of it's parts. Energy Recuperation uses less energy for battery charging during acceleration and continues to battery whilst decelerating, thereby reducing energy waste. Stop-Start technology saves fuel by switching off the engine when the vehicle is stopped and seamlessly re-starting it when the brake pedal is released (for automatic vehicles) or the clutch is engaged (for manual vehicles), saving fuel and reducing the impact of your vehicle on the environment. Low rolling resistance tyres need less engine power to propel the car forward, saving fuel and helping to lower emissions, while still offering excellent performance and driveability. TDI diesel engines are powerful yet fuel efficient, thanks to longer gear ratios, and are fitted with Diesel Particulate Filters to trap even the finest carbon particles. Our award-winning TSI engines are smaller and lighter, reducing fuel consumption while giving maximum pulling power. Revised engine management software, optimised to improve efficiency. Longer gear ratios in higher gears for the most economical fuel consumption. Overall body mass has been significantly reduced on BlueMotion models to make them even more fuel efficient. Lowered suspension on Polo and Golf to reduce drag co-efficient and improve aerodynamics. Covers have been installed under BlueMotion vehicles to improve their drag co-efficient. The closed front grille on BlueMotion models also helps to reduce drag through lower air resistance. Lightweight alloy wheels improve aerodynamics. A more aerodynamic tailgate spoiler reduces energy loss. A unique signature range of colours and interiors. 15. The BlueMotion Badge*The BlueMotion badge identifies the cleanest cars in the Volkswagen range, incorporating many different energy-saving features. The BlueMotion badge represents a Volkswagen that is kinder to the environment and better for your wallet.